If you overpay the capital gain tax on the sale of an asset, you can claim a refund for the overpayment. 2. Is the Principal Amount for a Mutual Fund Investment Taxed? When you sell a capital asset, the difference between the purchase price and sale price is your capital gain or loss, which you must report on your income tax return. The Internal Revenue Service considers any investment a capital asset. When you sell an asset for profit, you must pay capital gain tax on the sale. If you previously claimed the sale of a capital asset and overpaid the capital gain taxes, you are entitled to a refund of the overpayment. To claim the refund, file an amended tax return for the year of the overpayment. Download a copy of Form 1040X, Form 8949, Schedule D and each form's instructions from the IRS website. 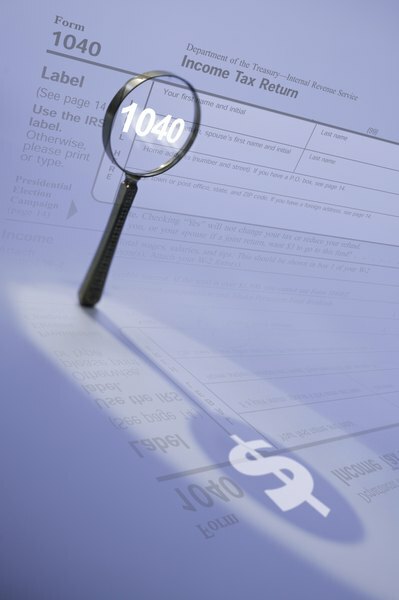 To calculate your tax, you will also need a copy of the 1040 instructions. Complete the top portion of Form 1040X, which requires your name, address and Social Security number. Copy the information from your original income tax return to Column A of Form 1040X. Revise the amounts on Schedule D and Form 8949 using the cost basis statement or Form 1099-B. Because you overpaid the capital gain tax, the amounts on both forms should differ from the amounts listed on your original income tax return. Calculate the difference between your capital gain amount listed on the original Schedule D and the revised version. Because you are claiming an overpayment, this amount should be negative. Write the negative amount in Line 1, Column B on Form 1040X. Subtract the overpayment amount listed in Line 1, Column B from your original adjusted gross income listed in Line 1, Column A on Form 1040X. Write this number in Line 1, Column C.
Transfer the amount from Line 2, Column A to Line 2, Column C. Perform the remaining calculations in the Income and Deductions section to determine your taxable income. Calculate your tax liability using the same method you used on your original tax return. Enter this amount on Line, 6 Column C. Write the method you used to calculate the tax in the field below Line 6. If you used Schedule D to calculate the tax, write "Sch D" in the field. If you used the Qualified Dividends and Capital Gain Tax Worksheet included in the Form 1040 instructions, write "QDCGTW" in the field. Subtract the amount listed on Line 6, Column C from the amount on Line 6, Column A. Write this amount in Line 6, Column B. Because you overstated your capital gain tax, this number should be negative. Complete the Tax Liability and Payments sections by transferring the amounts from Column A to Column C and performing the required calculations. Complete the Refund or Amount You Owe section to determine the amount of your overpayment. Mail Form 1040X, Schedule D, Form 8949 and any supporting documents to the IRS address listed in the 1040X instructions. As of 2012, the IRS does not allow you to file amended tax returns electronically. You should receive the refund of your overpayment within eight to 12 weeks.